Rodents are omnivores, which means they are capable of eating all kinds of food and products. Thanks to their constantly growing teeth, they have a great need to chew on everything they come across. A family containing ten rats generates 54 litres of urine and 146,000 droppings in a single year. 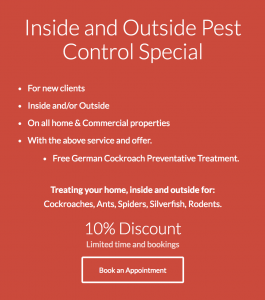 How is the rodent control service carried out? Our technician will firstly investigate the area that rodents have been sighted as well as areas where rodents like to inhabit. Once the habitation areas have been found, the technician will place baits down in the roof void or the sub-floor area out of your family’s way. Once the rodent takes the bait it typically takes between three and five days for the active ingredient to take effect and for the problem to be eliminated. We also provide lockable rodent boxes as an alternative to the baiting process. Bait boxes come in two colours – standard black, or garden rock shaped and painted ready to be placed outside in the garden. Rodents find ways to enter homes through tiny cracks and holes. They make nests in unused corners, and they can exist on crumbs. You may not even notice the presence of one or two, but if you aren’t careful you could end up with a full-blown infestation on your hands. The key to preventing mice and rats from coming inside is to seal your home, clean out places where mice like to nest and remove their food sources. The house mouse is the species of mice responsible for the mouse plagues in rural Australia. Favouring dry areas, you’ll most likely find a house mouse nesting in roof spaces, furniture, wall cavities and sometimes in the outdoors. The house mouse is an omnivore, so they prefer eating cereal grains. They will only grow to weigh approximately 20 grams and have a very fine and slender body that allows them to travel through tight pipes and through small holes. Also known as the ‘brown rat’, ‘water rat’ or ‘sewer rat’, the Norway rat is a combination of multiple rodents’ species. The small rodent is the largest out of the pest species of rats and mice, weighing around 450g, and they can become aggressive when provoked. They can live both indoors and outdoors, nesting in sewers, around waterways and digs burrows. They are very good swimmers. The smallest rat among the three species, the roof rat, also known as the ‘black rat’ is found in roofs. They are a very timid species, but agile as they can climb well. Unlike the others, they don’t burrow, aren’t strong swimmers and rarely venture into sewers. These rats also have a very slender body making it easy for them to slip through cracks and holes in buildings. Why are rats & mice pests? Ruining doors, books, upholstery, food containers and skirting boards. Droppings: Rodent droppings when fresh are malleable and shiny. After two to three days, they become hard and lose their sheen. Mouse droppings measure about 3 to 6 mm in length, often contain hair and are pointy at the ends, while rat droppings are blunt and can measure up to 12 mm in length. Rub marks: When the fur of rodents rubs against walls and other surfaces, they leave behind a greasy residue, most noticeable when dealing with very large infestations. Burrows: Rat tunnels are commonly seen close to buildings and waterways. Sounds: Mice and rats often make noise at night. If you hear the squeaking of mice or gnawing of rats, you might have an infestation case on your hands. Nest: Materials like paper, cardboard and rags are commonly used to build nests. Gnawing: Due to their growing teeth, rats need to constantly gnaw on materials like wood, conduit, cables and metal this helps to sharpen their incisors and grind down the length of the teeth. When they bite on cables, they leave behind exposed wires which can then lead to fires or short circuits. If you are seeing any of these signs you should contact us to schedule a rodent control service.